Today’s Indie Debut star is Eva Jordan, whose novel 183 Times A Year is about mothers and daughters, a relationship that always has a lot of material to mine! Firstly, I’d like to thank the lovely Amanda, fellow Urbane author, for having me on her blog today. Amanda suggested I write a post about the themes discussed in my debut novel. Write what you know, I was advised. So I did. Inspired by the women in my life including my mother, daughters and close friends, 183 Times A Year is a humorous observation of contemporary family life. 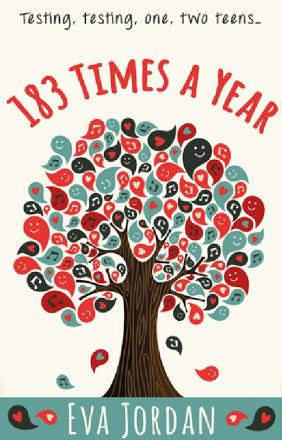 Love, loss and friendship weave their way throughout this amusing and sometimes tragic story, however, in the main, 183 Times A Year is a poignant, heartfelt look at the complex and diverse relationship between a mother and her teenage daughter. Our history books are littered with notable mother­-daughter relationships including Mary Wollstonecraft and Mary Shelley, Marie Curie and Iréne Joliot­ Curie, Laura Ingalls Wilder and Rose Wilder Lane and Emmeline Pankhurst and Christabel Pankhurst to name just a few. Seen from two points of view, 183 Times A Year is narrated through two very different voices, namely Lizzie and Cassie. Lizzie is the exasperated mother of Cassie, Connor and stepdaughter, Maisy, and the frustrated voice of reason to her daughter’s teenage angst. She gets by with good friends, cheap wine and talking to herself—out loud. Whereas 16-­year­ old Cassie is the Facebook­ing, Tweeting, selfie­ taking, music and mobile phone obsessed teen that hates everything about her life. She longs for the perfect world of Chelsea Divine and her ‘undivorced’ parents—and Joe, the gorgeous boy every girl fancies. Although I am both a mother and step mother and was therefore able to draw on many of my own experiences, as well as those of friends and family (when Cassie refers to Virginia Woolf as Canary Wharf and the current British Prime Minister as Cameron Diaz, I was actually drawing on fact, not fiction), I also carried out a great deal of research. I discovered (and suddenly remembered) that being a teenager isn’t easy. Nonetheless, being the mother of such isn’t always a bed of roses either. Whilst most five­-year ­old girls love their mother with an unshakeable conviction, it is often a different story by the time they reach their teens. The once adored mother who barely put a foot wrong is suddenly doing or saying embarrassing things and dumbfounded mothers discover their testing teens often feel criticised or judged by their well-­meaning actions or advice. Throw in step-parents and step-siblings to the mixing pot of today’s divided and extended families and you’re probably in for a bumpy ride. fall out with their friends 127 times despite spending 274 hours on the phone to them. Guess what they do 183 times a year! So, although at times the mother-daughter relationship is a road fraught with diverse and complex emotions, it can also be – like many strong, female friendships – very enriching and rewarding. If mum and daughter can hang in there, the relationship comes full circle and usually moves to a different level altogether. Often blossoming into a loving, respectful relationship. However, if all else fails, remember…it’s not a life, it’s an adventure! If you’d like to read 183 Times A Year, the ebook version is currently reduced to £1.99 and is available here.